Up to this point I have covered the basics of building TSM settings. 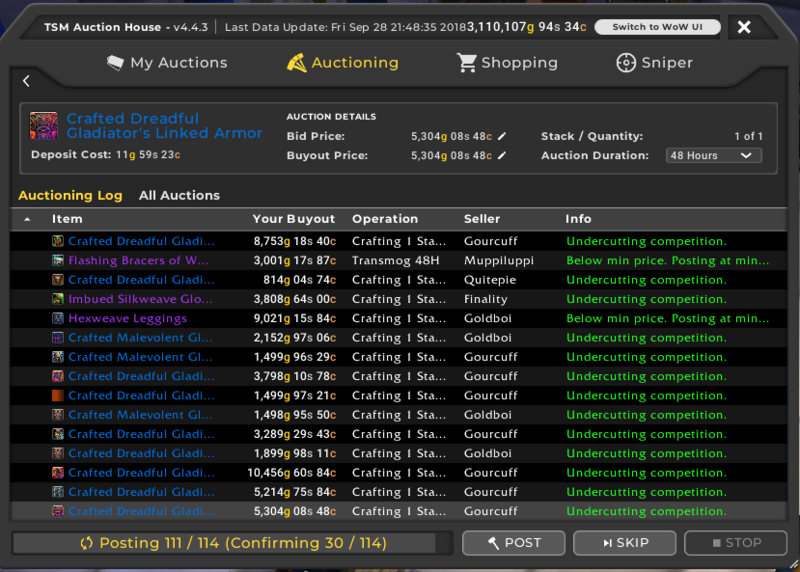 It’s now time to go look at how we use the auctioning operations to actually buy and sell items. As I have mentioned before the main advantage of TSM is that it allows you to save a ton of time when purchasing and selling items, as you can make all of your decision making rules up front. The main way it does this is by introducing a single macro for posting, buying and even canceling auctions. You can bind this macro to your mousewheel to make buying and posting a large amount of auctions incredibly effective. It will post or buy according to the rules defined in your operations. The first thing we want to do is to set up the scroll wheel macro. To do so we head to the settings pane in TSM by opening the main TSM window with /tsm. 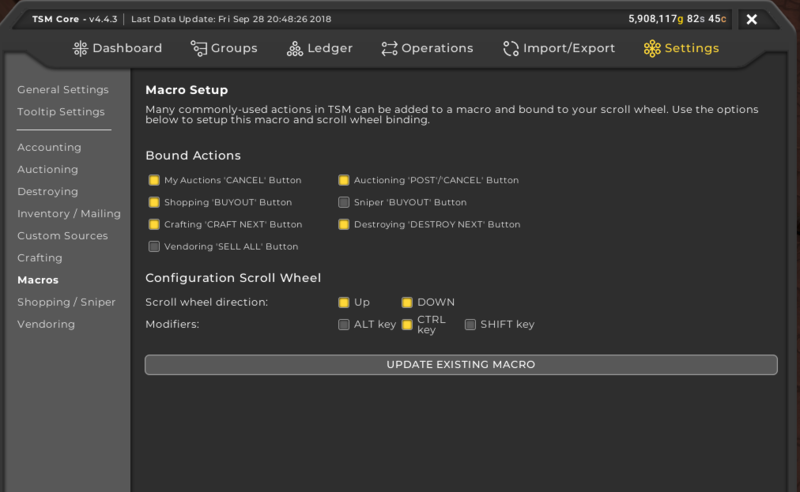 Click macros to open the macro setup menu. You can choose which actions you want to bind to the macro as well as which modifier you want to use. My setup is shown in the screenshot below. After setting up the macro I can just hold down control and roll the mousewheel to post my auctions when performing an auctioning scan. Now that we have the macro setup and a group with operations for enchants it’s time to head to the auction house. We want to go to the auctioning view. It should look like the screenshot below. We will mostly care about the left part here. The top part, marked in red, is where all your groups show up. You will only find groups here that has an auctioning operation applied. In this area you choose the groups you want to perform an auctioning scan for. I usually scan all my groups at the same time. In some cases it is better to just scan a few groups such as if you want to repost enchants only, as one of your posted ones sold. Below the group selection you have two options, “Run Post Scan” and “Run Cancel Scan”. 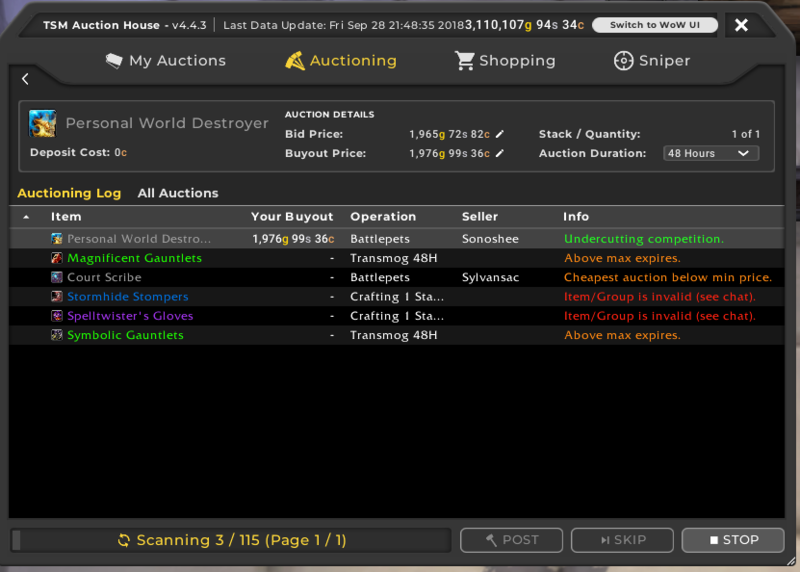 The post scan option will go through all the groups you have selected and post auctions according to your operations. The way this works is it scans the AH for the item and resolves your pricing rules. 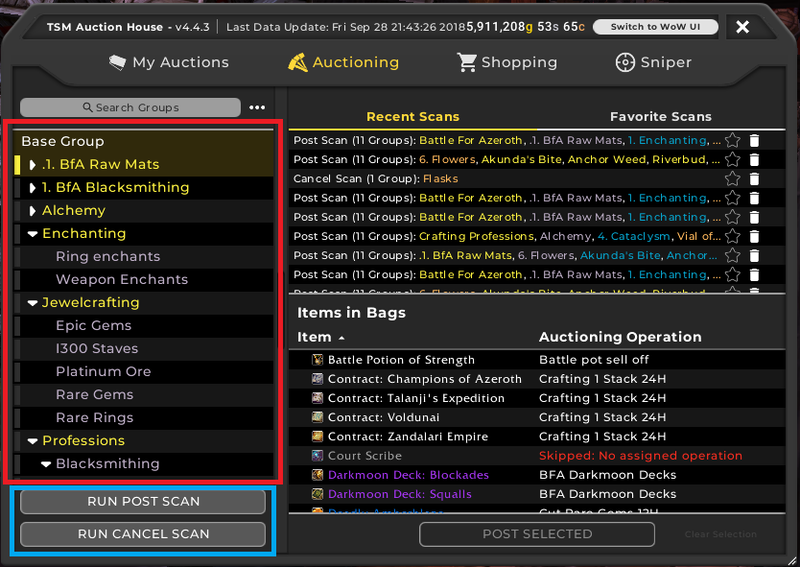 Then after it has scanned all items in your bags that are in groups you can post your auctions by utilizing the macro we bound to our scroll wheel. Eventually you will be posting hundreds of auctions at a time and scrolling through them is a massive time saver. 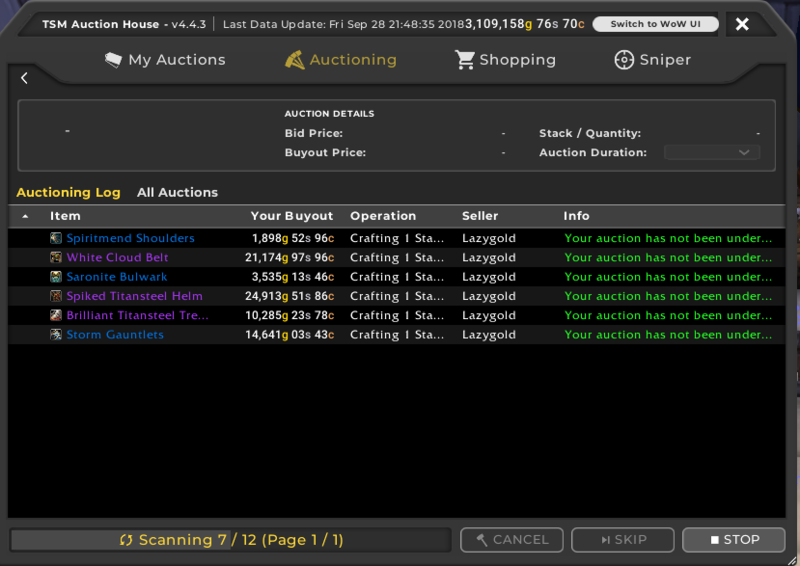 Cancel scans will go through your auctions for the groups selected to see if any of your auctions have been undercut. It will cancel any auctions that have been undercut as long as the lowest price on the AH is not below your minimum price for your auctioning operation. I don’t personally use cancel scans too much, but they can be very useful for markets with heavy undercuts. You can quickly select all groups or deselect all groups using the three dots at the top right of the group selection window. This will save you a lot of time if you want to switch between scanning all your groups and just posting a single group. We’ve gone through all of the options you need to be aware of to quickly and easily post your auctions to the AH with TSM. Let me know if you have any questions in the comments. If you want to join a community of like minded gold makers supporting each other consider joining me on Patreon. I’m one of the few people that can’t use a scroll mouse wheel. I can only use “marble” mouses. Is there a way to use a normal mouse? Thanks! If you go through the macro setup you can find the macro on your macro interface and bind it to any button you prefer. “Did not post [Enchant] because your minimum price (120%crafting) is invalid. Check your settings. That means that either one of the materials has an invalid source (typically this happens for BoP items) or TSM failed at scanning your profession window correctly.